Indian Rosewood's heartwood varies from golden brown to dark purple-brown. It's sapwood is cream colored. Some blanks contain both heartwood and sapwood. 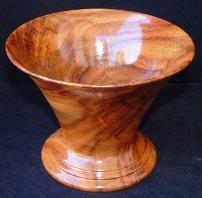 They yield finished turnings with great contrast. Indian Rosewood provides a wonderful grain pattern. It is hard and dense, and has good stability. 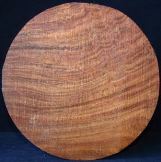 Rosewood is an excellent turning wood and finishes extremely well. Rosewood is also prized for its use in tool & knife handles, custom pool cues, furniture, and cabinetry. Our woodturning bowl blanks and spindle blanks are green wood. They are sealed in wax to slow or prevent drying. 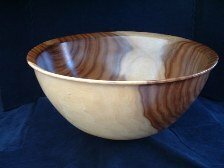 This two tone Indian Rosewood bowl is a favorite of mine. It contains both heartwood and sapwood creating a beautiful complimentary color scheme.